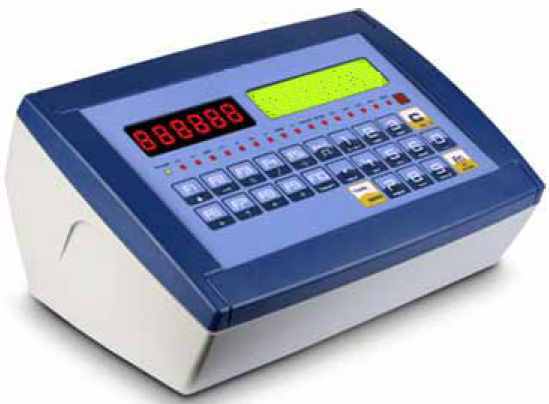 High performance digital weight indicator, with programmable inputs and outputs, 3 serial ports, transmission protocols for data communication, completely configurable printouts, integrated alibi memory, graphic display and port for connection to barcode/badge reader. The wide range of connectable accessories and printers guarantees the maximum interfaceability and versatility. CE-M approvable (OIML R-76 / EN 45501). Easy to clean ABS waterproof IP65 enclosure; resistant to harsh and corrosive environments. Suitable for use on the table, column or wall. - Saving and filing of all the information on PC. Available in "P" version, fitted with attached printer as standard. Two RS232 serial ports, for connection to printer, radio module, PC or PLC, badge reader or remote scale, with management of the CTS signal. Infrared ray input for optional remote control. Protection card against electric discharges and disturbances.